Contrary to the stereotype, most developers I know enjoy talking with each other about our work. Many of us spend a lot of time pair programming, and anything from code standards to the best way to fix that pesky bug can spark a lively debate. In fact, a lot of our time is spent enjoying impromptu discussion. However, when you add a few more people, plan that discussion for later, and book a meeting room, most developers will inwardly groan. 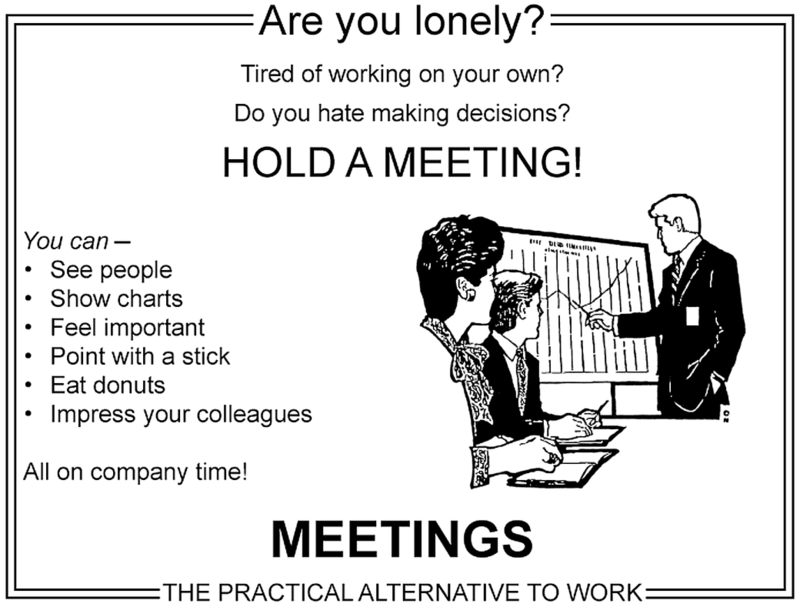 The number one reason I’ve heard for not wanting to become a tech lead is “too many meetings”, sometimes followed by “no time to get any actual work done”. This post is about how to spot “smells” for when a meeting is turning toxic, and tips for how to turn a tiresome, unproductive discussion back into that enjoyable exchange of ideas and information. One or two people talk and others count the minutes until the meeting ends. This often happens when not everyone in the room has a full understanding of what’s being discussed. Sometimes, not everyone is interested in the content of the meeting, or feels that they can contribute to the solution. This can happen when several people come to the meeting with a different agenda. It often leads to people feeling that they’re being ignored, and the topic being hijacked. This is characterised by people arguing too much on the minutiae, trying to come up with every possible edge case. What did we agree again? A week after the meeting, everyone has a different idea of what they agreed to. Does everyone know the agenda? Everybody loves a democracy, but when it comes to setting a meeting agenda, a benign dictatorship can be the best approach. Ensure everyone knows the agenda before coming into the meeting. Ask people if they’d like to add any items to the agenda, and decide whether to keep these for a different time or group of people. If new issues arise during the meeting, you may wish to split into sub-groups with different agendas. Is everyone interested in being here? Can you a) contribute information or help solve the problem or b) learn something you’re interested in? The best meetings have voluntary attendance, and it’s also useful to check if people would prefer to leave when the topic changes. Does everyone understand the problem space? It’s tempting to jump into a solution when two of you understand the problem well, but you risk losing some valuable contribution if others in the room have an incomplete understanding of the problem being discussed, or the systems involved. The best way to ensure everyone has the same picture in their head is to draw it! Avoid getting dragged into a discussion of edge cases and minutiae before everyone understands the vanilla case. Use a concrete, vanilla example to understand the problem, and add edge cases to the discussion over time. Does everyone understand the solution? We’ve all been in the situation where we all agree on a solution, only to see something completely different implemented later. Make sure everyone has the same picture in their head. Draw it! Create action items, assign people responsibility and write them down. After the meeting, email everyone present the key points of the solution agreed to, the action items, and the people responsible for these actions. You will be amazed at how an item you agreed on can change in people’s minds without written notes to return to. Sticky notes are your friend! At Auto Trader, diversity is the key to getting good results, and that includes diversity of thought. It’s important to ensure that everyone in the room can share their thoughts, introvert and extrovert alike. I’ve often found that when I’m seeking people’s opinion, getting each individual to first write thoughts on a few sticky notes, can ensure that no one opinion drowns out another. Everyone gets a chance to explain what’s on their sticky note, so everyone is heard. It also gives everyone a few minutes of quiet time, to give people a chance to think about what they want to say. Take regular breaks, and don’t add too many meetings to one day. Often, no-one wants to be the one to suggest a break, but if you’re feeling an energy lull, the chances are others are too. Sometimes you can talk a problem to death. Don’t be afraid to ask “Should we spike this out first?”. Often, “just do it” is the fastest way to a solution.